Interstate is Wisconsin's oldest state park, established in 1900. Located along the picturesque St. Croix National Scenic Riverway, the park provides scenic views of the river and the steep-sided gorge known as the Dalles of the St. Croix. The Ice Age Interpretive Center features a film, photographs, murals, and information about the great glaciers. Interstate park offers hiking, rock climbing, swimming, canoeing, fishing, and more. have a total of 82 family campsites and two primitive, group campsites. The two group sites can accommodate a total of 60 people. Shower facilities are available in the north campground for registered campers. There is a dump station across the road from the Ice Age Center. 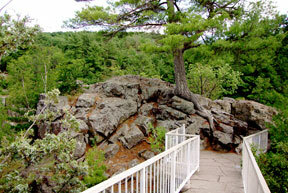 There is so much to do at Interstate State Park, located on the beautiful St. Croix River. Visitors can climb the cliffs of the St. Croix River Dalles, canoe the flat-water, watch kayakers rush through the rapids, or relax on an excursion boat. Spring brings a great diversity of wildflowers, and in fall, the St. Croix River Valley forest is ablaze in the autumn colors of red, gold, and orange. The geology that formed this park intrigues visitors and brings geologists from all over the world. At least ten different lava flows are exposed in the park, along with two distinct glacial deposits, and traces of old streams, valleys, and faults. During the summer, hike the trails and explore the glacial potholes that make this park unique. For more information and to reserve a campsite, visit here. With over 40 riverfront acres in the beautiful St. Croix River Valley, our campground is the ideal base of exploration for the many exciting natural treasures of Taylors Falls. Whether you want to "rough it" in one of our premium campsites or have all the comforts of an RV hook-up, we offer a get-away that is just what you’ve been looking for. Remote enough to be a welcome break from urban life, but close enough to enjoy any weekend, make camp Waub-O-Jeeg a family tradition. Wildwood RV Park and Campground has a variety of campsites, fun on-site activities, and is located within minutes of the unique town of Taylors Falls, the St. Croix River, state parks, and Wild Mountain Recreation Area. There is something to do here for all ages and interests. You could cool off in our swimming pool, play some basketball, volleyball, or horseshoes, canoe the St. Croix, take a boat tour or dinner cruise, hike the rocky bluffs, or take in a show – just to name a few! To provide for the public enjoyment of the Riverway, designated primitive campsites have been established throughout the National Park above the Soo Line High Bridge. Camping is allowed only in officially designated sites, and there is a three-night limit on visitor use. All sites are marked with a campsite sign and have a fire ring. Some have a picnic table and primitive toilets. Most are accessible only by boat or canoe.